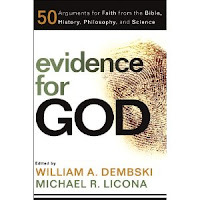 The Question of Science — the "science" section in Dembski & Licona's Evidence for God — has so far been mostly pushing intelligent design and little else. But we know that intelligent design is a philosophical idea, not a scientific one. And so we come to Chapter 22, "Molecular Biology's New Paradigm — Nanoengineering Inside the Cell" by Bill Wilberforce (not his real name — see the bio on 4truth.net for why). It's more of the same: cells are highly complex and could not have evolved, so they must have been designed by an intelligence. Wilberforce quotes Michael Behe in support of this, but once again omits a crucial point (a point, incidentally, that all ID proponents omit). Biologists most often identify the high-tech nano-engineer as Nature herself, and the implications of intelligent activity are quickly brushed aside. But, as Lehigh University biochemist Michael Behe has said in regard to this situation, "If it looks like a duck, walks like a duck and quacks like a duck, it probably is a duck". Behe's "inducktive" reasoning is quite sound. In any other field, things that look like they have been carefully engineered are presumed to be engineered. But in any other field, the presumption of a designer is that the designer is human. The only designers we have ever encountered are human (at least as far as any appreciable level of complexity is concerned). Based on Behe's reasoning the only sound "inducktive" conclusion is that the cell was designed by a human. Reasoning that the designer is non-human is far from "sound". We have no idea what non-human design is like, because we have no examples of it. But no humans have come forth to claim authorship of the cell, and it seems reasonable to suppose they never will. Therefore the suggestion that the cell's complexity arose naturally by a series of gradual stepwise refinements is entirely legitimate. From everything we have learned thus far, the answer seems to be the latter. Though it is possible that the tools of molecular biology will uncover some self-engineering mechanism (akin to self-organization, but which produces complex machines instead of repeating fractal patterns), this scenario seems unlikely. For starters, the trend has been toward the unveiling of more and more complicated systems, not mechanisms that show how they are produced. Furthermore, laws of information production, developed to address questions arising in our computer-driven information age, weigh heavily against such a mechanism. That's surprisingly tentative, given the insistence ID proponents usually indulge in. It's a mere assertion; Wilberforce provides no figures to back up his "weight" — no science, in fact. It's just so much unsubstantiated speculation. If ID proponents really think their idea has legs, then they should run with it: go into the lab, do some actual science, write it up and get it published in a respected peer-reviewed scientific journal. Then, and only then, will ID be worth anyone's time.